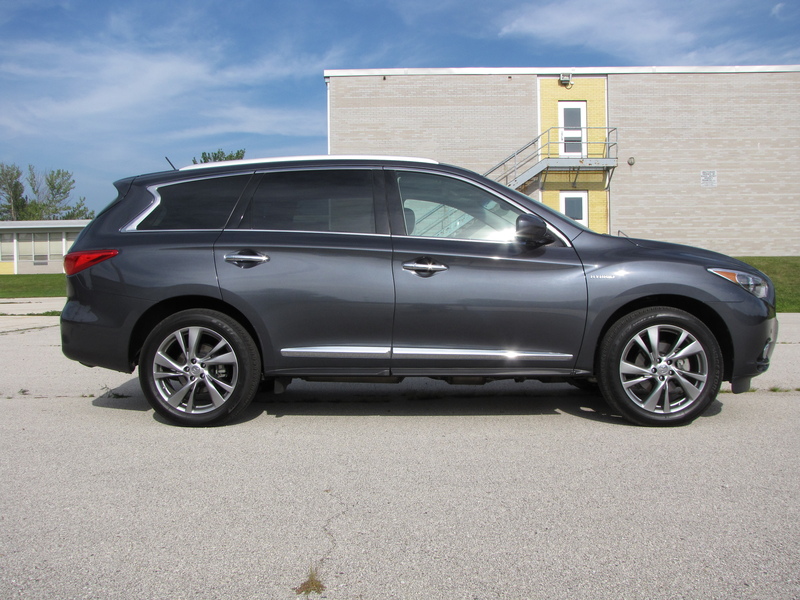 Like its sister crossover, the Nissan Pathfinder, the upscale Infiniti QX60 is a roomy family hauler that’s easy on the derriere, quiet and comfortable and can, if needed, haul seven passengers due to its third row seat. A couple years ago the Pathfinder switched from being a rough and tumble sport-utility truck to a crossover based on the Nissan Altima sedan platform. It, like the Infiniti, still offers all-wheel drive, but the upshot is the ride is much improved and the likelihood of you ever taking it into the brush always has been pretty slim. The tested diamond slate (metallic dark gray) QX60 was a hybrid too, and came with AWD, so at least we know it’ll handle Wisconsin’s snow and slush just fine. The hybrid part means it costs a bit more, but should save you a few MPG overall. More on that later. 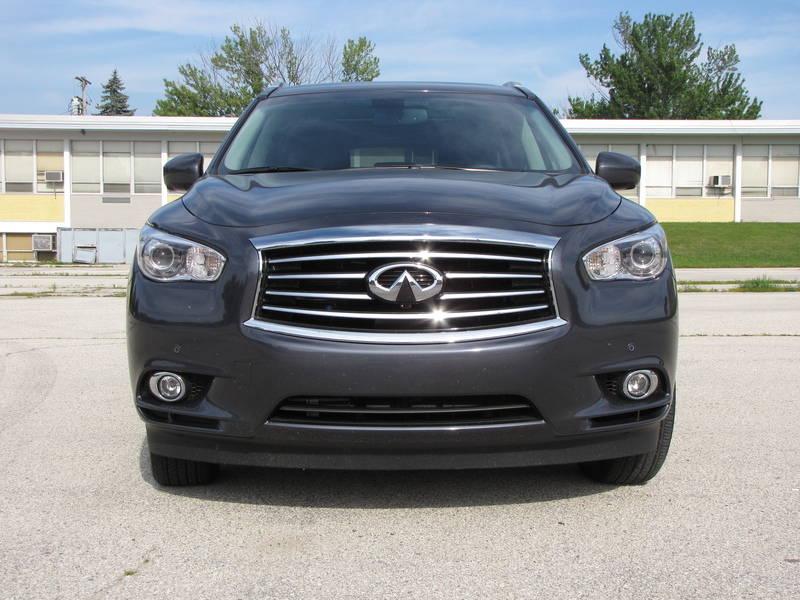 The QX comes in four models, the base QX, the QX50, QX60 and QX70, all of which designates the luxury level and accessories that come standard. The test vehicle started at $46,500, but was immersed in options so climbed to a lofty $60,780, including $995 delivery. That total is roughly double last week’s Dodge Journey crossover, also with AWD. No denying this is a more luxurious crossover in look and feel. It features chrome around the windows and a snazzy little S accent shape on the back side window to give the QX a styling flair in profile. The nose comes to a slight beak like point up front too. I like its look, at least as well as any large crossover. While a perfectly fine 3.7-liter V6 making 325 horses is standard in the base QX, the hybrid uses a 2.5-liter supercharged I4 engine with direct response hybrid system. Combined they create 250 horsepower. That’s enough to get the hefty 4,625-lb. vehicle up to highway speeds, and beyond. But it sounds like it’s working pretty hard at it if you crush the accelerator. This system is more comfortable smoothly powering its way to 60 mph or so with its continuously variable transmission syncing well with the hybrid and supercharged I4 power system. There’s some acceleration lag, especially as you transition from coasting to power, and when you first engage the CVT from reverse to drive. But the QX will cruise well and doesn’t feel as heavy as the most recent Pathfinder I’d driven. Handling too is fairly good, even responsive when you put the crossover in Sport mode. There’s a dial on the console that allows you to select Sport, Standard, Eco and Snow mode settings. Sport firms up the steering considerably and allows more aggressive shifts. Standard is fine, but with a lighter wheel feel while ECO numbs up the shifts and engine power to save fuel. Snow, well, I’ll have to presume it helps the QX start better in snow. Ride is excellent as the wheelbase is 114.2 inches. There’s also enough suspension damping to soften even the worst roads and keep the QX seemingly gliding over the highway. There are independent struts up front, a multi-link rear suspension and stabilizer bars front and rear too. Standard are 18-inch wheels and tires, but the test vehicle went to 20-inchers as part of a $6,050 deluxe technology package (more on that later). Braking comes from four-wheel discs and both stability and traction control are standard. 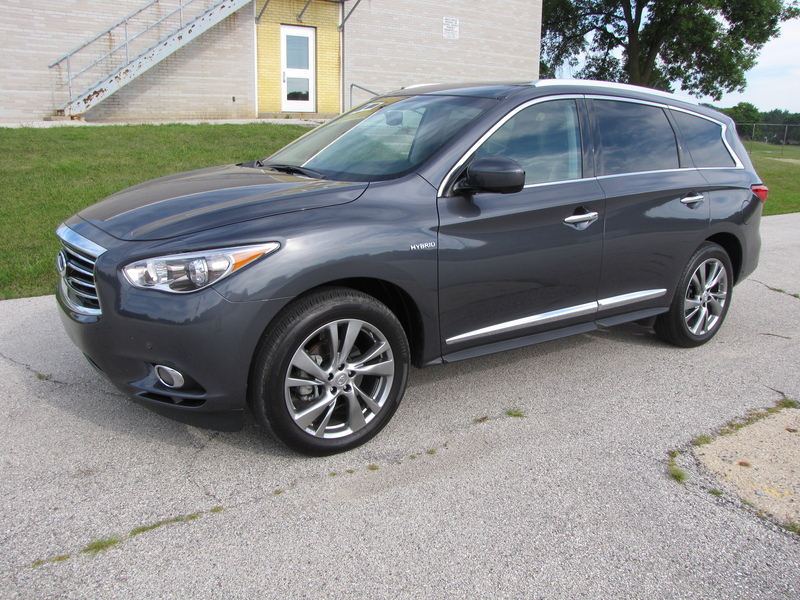 While this had AWD, a front-drive version of the QX60 with 3.5-liter V6 starts at $43,095. Inside, the test QX was clad in handsome black and brown leather, the dash black, the seats mostly dark brown with black trim. Gorgeous maple trim on the dash, console and center stack were part of the deluxe tech package. This looks ritzy. The dash is attractive and stylish with jewel-look metallic trim around the main gauges, which feature blue background rings. Everything is easy to see and read and the power front seats are easy to adjust, the driver’s having a power up-down lumbar support. Those seats, while relatively flat, are quite comfortable and the seat back has ample side bolsters. 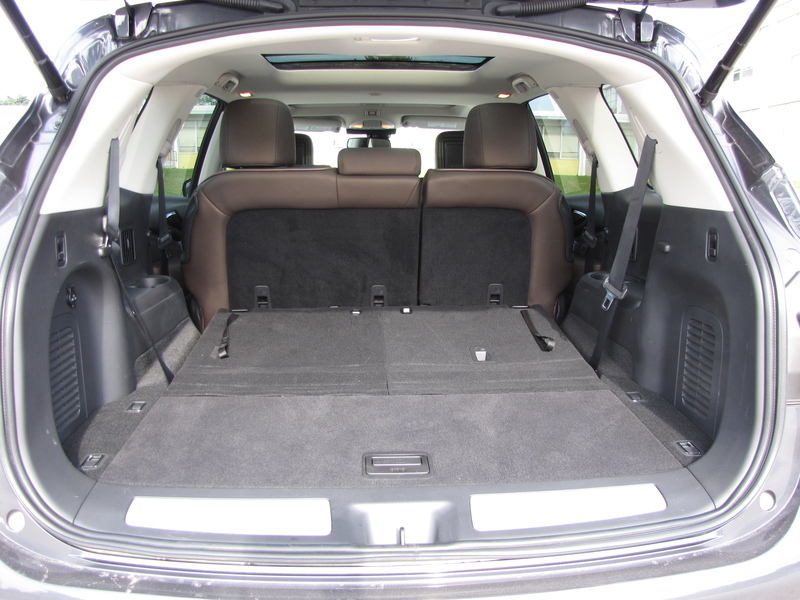 Rear seats, while they will recline partially, are stiffer and less comfortable, but roomy. The third row also folds flat into the floor, but as with most third row seats is pretty cramped. There also is a tight space between the front seat, edge of dash and steering column for us shorter drivers. Put the seat back a half inch or so and it’s fine, or power the tilt/telescope steering wheel up and entry and egress are simplified. Speaking of the wheel, it’s heated, again part of that deluxe package, which is massive. It also adds a Bose Cabin Surround sound system, a bunch of connection options, heated and cooled front seats and heated second row seats, a second and third row power moonroof with shade, backup collision warning, intelligent braking and cruise control, blind spot warning, distance control assist and a lane departure system. Now you know why it costs $6,050. All of that tech whiz stuff works fine, but the lane departure system is annoying as the beep is particularly loud. After several days I figured out how to disable it, no thanks to Infiniti’s “War and Peace” thick owner’s manual. You can cut the beeping by turning on a turn signal any time you change lanes, always a good idea. But let’s be honest sometimes a road dips or slants enough that you get near a center or side lane market and this system’s incessant beeping does NOT help at that point. I feel the Infiniti dash is on the button crazy side too, with 25 buttons and knobs for adjusting the large touchscreen. Hmmm, shouldn’t the touch screen eliminate some of these buttons? In any case, the button overload feels overwhelming, plus there’s a center knob to turn and “help” you adjust through the screens, which do everything but give a drive his or her horoscope. There’s gas mileage history, a button to show you not only the rearview camera view out back, but what’s alongside the car too. Sensors beep if you’re near much of anything, but these are not as touchy as most. Yet twice I had the front parking sensors go off as I was “backing” out of a parking lot. Odd since I was in reverse and the bushes I was being warned about were in front of the QX. Too much technology sometimes! The rear seats power down and there’s a lot of cargo room with them lowered. Yet I like the power rear hatch and the blind-spot warning system that blinks in the outside mirrors when a vehicle is in your blind spot. Other pluses included lighted kick plates ($440 option), a theater package that added monitors in the back of the front seat headrests, plus the hookups and headphones you need, another $1,700 package. A hybrid premium package for $4,600 delivers the power lumbar, heated wheel and a 13-speaker Bose system, two-memory driver’s seat, remote start, tilt-down and flat to the vehicle outside mirrors, real-time traffic and weather info and voice recognition for the navigation system. As for the hybrid system itself, it did shut the vehicle off from time to time when the QX was stopped, but often stayed on to keep the air conditioning pumping. I did get somewhat better gas mileage than in most large utes. I managed 23.4 mpg in a mix of about 70% highway driving while the EPA rates this at 25 mpg city and 28 highway. I maxed out at 25.2 in a trip that was about 80% highway. Overall I like the QX, which is a pleasant driving and riding luxury crossover and its hybrid system works well enough to give you a bit of a gas mileage boost. Pricing, once all the options are added seems on the high side, but you can control that with some option restraint. Also consider the Nissan Pathfinder if a little less luxury will suit you. Hits: Roomy and attractive inside and out. Extremely nice ride and handling, especially in sport mode. Heated wheel and heated/cooled front seats and power tilt/telescope wheel. 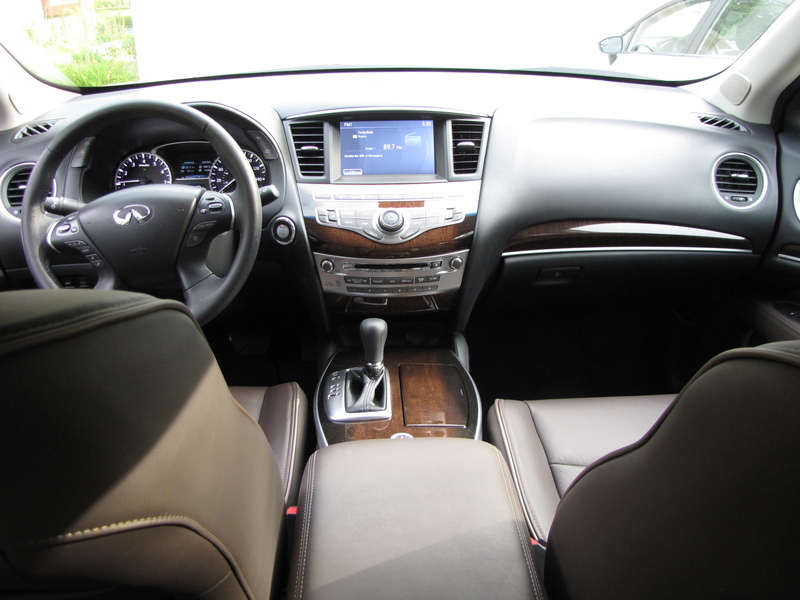 Power rear hatch, third row seat, two sunroofs, great seats and luxurious interior styling. Misses: Button crazy center stack like former FX models, acceleration lags as CVT hunts for proper gear ratio, beeping lane departure system annoys when on, hard for short driver to enter vehicle as it’s a tight squeeze for knees. Third row seat is cramped.